If you are looking for the modern RuneScape guide for this content, please see our Enlightened Journey guide. On the peaceful island of Entrana, a lone monk has tired of his life of simplicity and quiet reflection. Auguste wants to boldly write his name in the history books; to craftily defeat the laws of physics; to miraculously sail through the air...preferably not to horribly explode into a ball of flaming death. Of course, to do all this he'll need the help of a worldly adventurer: are you bold enough to merrily laugh in the face of the unknown? Begin by talking to Auguste in Entrana. To start the quest, you must speak to Auguste. He is found in southwest Entrana, north of the herblore shop. 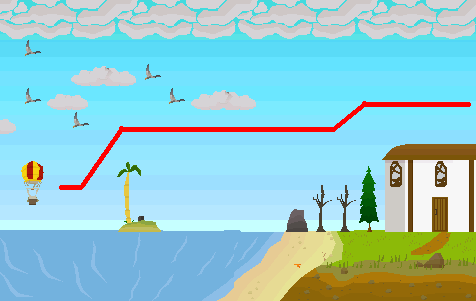 Note that you cannot take weapons or armour to this island. 1 Ball of Wool - Wool can be obtained by using a pair of shears on sheep, found in Lumbridge and Falador. You then use the wool on a spinning wheel, found in Lumbridge, Barbarian Village, Seers' Village or Tree Gnome Stronghold. Can also be bought in the Ardougne general store. 3 Papyrus - This can be bought in the general store just north of Tai Bwo Wannai Village, in Shilo Village general store, Ardougne general store, or from Ali Morrisane's shop in Al Kharid. Papyrus can be collected for free from the respawn in the Legends' Guild. 1 Sack Full of Potatoes - First you must buy a sack from a farming shop (some found just south-west of Falador, and in Catherby), and then fill with 10 potatoes. Potatoes can be grown using the farming skill, or collected from fields in Lumbridge or Ardougne. 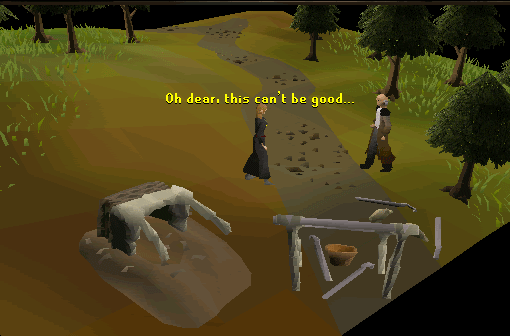 1 Unlit Candle - Can be bought from the candle shop in Catherby or by the entrance to Lumbridge caves. 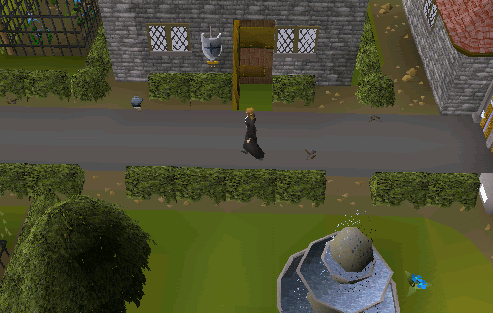 Or, you can pick up a lit candle from the Watch Tower in Yanille, and just extinguish it. 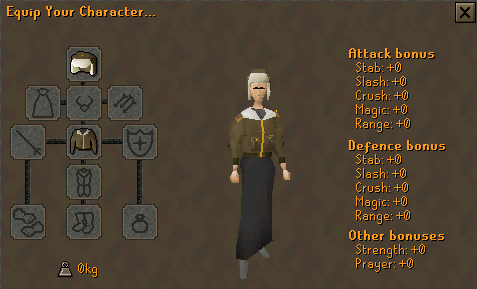 Once you have all the items needed, return back to Entrana, and speak with Auguste. He now wants you to build an origami balloon. To do this, use papyrus onto the ball of wool. It should now look like this: Then, add the candle, and it will look like this: . Now go back and speak to Auguste. You now try and fly the balloon! The balloon sadly bursts into flames. But Auguste is pleased, and says its time to go to next stage. Now give him the sack of potatoes and the remaining papyrus. Another experiment happens! He says that the experiments are going well (even though one was burned down and the other destroyed). He then tells you to build the actual balloon. 1 Red Dye - This can be bought from Aggie in Draynor Village if you bring her 3 red berries (found south-east of Varrock) and 5gp. 1 Yellow Dye - This can also be bought from Aggie, but for 2 onions (can be collected from behind the farm in Lumbridge) and 5gp. 10 pieces of silk - Can be bought in Al Kharid, Varrock or Ardougne, and also can be stolen from stalls in Ardougne. 1 Clay Bowl - There is a bowl respawn upstairs of the glassblower's hour directly southeast of Auguste. Alternatively, this can be made by a player, by using a piece of clay with water, then using it on a pottery wheel, and then on the pottery oven. They can also be bought in most general stores. 8 Sandbags - This is simply 8 of the sacks you used for the potatoes, but filled with sand instead of potatoes. 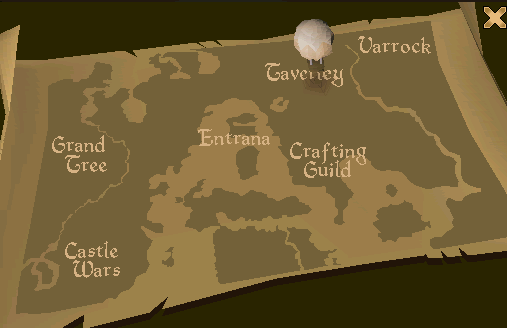 Sand can be found in Entrana, Yanille, Rellekka or Zanaris. You can take some of the items to Auguste and then collect the rest, you don't have to take all of them at once. But that is not all. You also have to grow a tree. It turns out you have to grow a willow tree. Use the sapling on a tree patch to grow it. He also gives you a basket of apples, so that you can give this to the farmer. The farmer will watch your tree grow instead of you waiting beside it in case its diseased. If you lose the sapling Auguste will sell you another for a very pricey 30, 000gp. Or, you can grow a normal willow tree and use secateurs on it to get branches. It is helpful to grow another willow tree at the same time, or to have one already grown. This saves you waiting for branches to grow back. When the tree is grown, you cut 12 branches off the tree using secateurs. He tells you that the branches are for the metal frame on the platform. It's best to plant the tree first, as this will take a while to grow. When you have the items except the branches, give them to Auguste. Now you just have to wait about 3 hours and 40 minutes for the tree to grow, or cut branches of a willow tree you have already grown. But you can only cut a certain amount of branches before you have to wait again for more branches to grow. It takes about 10 minutes for another branch to grow. You are then told that you need 10 normal logs to fuel the balloon, and you must NOT weigh over 40kg. You also need a tinderbox. In order to get to Taverley (your destination), you need to land on the targets the druids have drawn on the ground. 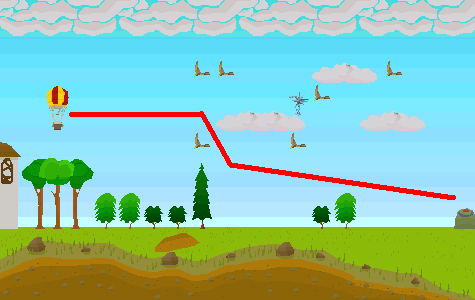 If your balloon goes to low then you add logs to the fuel. If you go too high, you drop a sandbag. You also must avoid all things that block your path. There are also two ropes on the balloon. The red one is the "emergency" one. It will make the balloon drop quickly. The other one will make you drop more slowly. Not to worry though, just follow the path, and click on the "Leave Dirt" option to exit. What you need to press is as follows: 1 Bag, 1 Wood, 10 Relax, 3 Ropes, 7 Relax, 1 Bag, 9 Relax, 1 Wood, 13 Relax, 1 Red Rope, 1 Relax, 1 Rope, 1 Relax, 1 Bag, 1 Rope, 3 Relax, 1 Rope, 1 Relax. If you succeed you end up in Taverley. Speak to Auguste. He will give you a bomber jacket and cap as a reward, and say you can use the balloon in the future. Congratulations, you have completed the quest! To travel to a location, you can go to any of the above locations on the map and operate the controls. 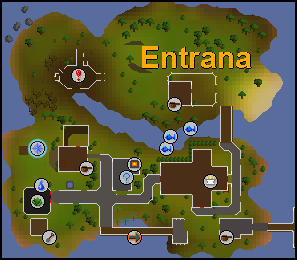 However, you must first unlock new locations by first traveling to Entrana and flying to your new destination from there. 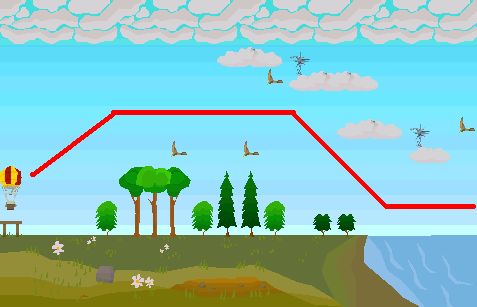 Once a location has been unlocked, you can fly to it from any of the above locations. Auguste will tell you that once you have "unlocked" a route, you only need 1 of that log to travel there again. In order to unlock routes, you need to solve a three-screen puzzle for each one. These can be made like before : Use papyrus on a ball of wool. Add a unlit candle. You can use a color dye with it to make it look better. Use a tinderbox on it and you can make it fly! Note that, like before, the balloon bursts into flames so you won't get it back.